The CPI Regenerative Thermal Oxidizer (RTO) is engineered to provide the most advanced and efficient thermal oxidization. 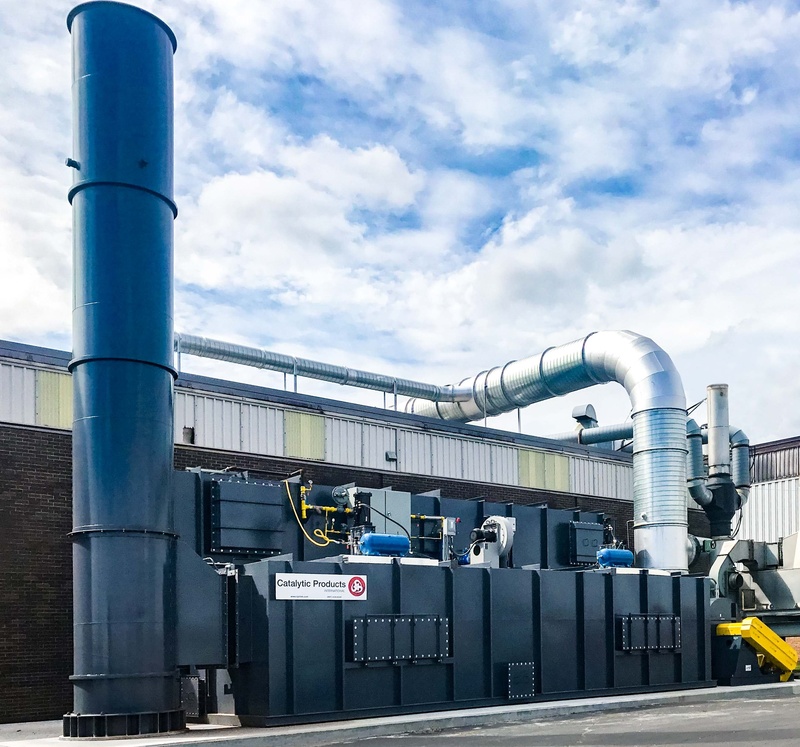 With thermal efficiencies of up to 97%, and destruction efficiencies that can exceed 99%, the CPI Regenerative Thermal Oxidizer (RTO) will give you the highest possible removal rates at the lowest cost. Each CPI Regenerative Thermal Oxidizer (RTO) is engineered and built to your specifications. We begin with three basic models that offer varying levels of VOC destruction and energy efficiency. We then take into consideration the particular characteristics of your air stream, such as quantity, temperature, composition, and the possibility of incorporating energy conservation into the process. Thermal treatment of Volatile Organic Compounds (VOCs) and other air pollutants works by a simple oxidation reaction of the harmful air pollutants with oxygen and heat. In this environment the VOCs are converted to harmless inert byproducts, water vapor (H2O), and usable heat. These harmless by-products are released to atmosphere or use an energy recovery technique to further lower the operational costs. CPI RTOs are considered among the world's most advanced regenerative thermal oxidation systems. These specially designed, cost effective, proven systems combine the basic principles of time, temperature, and turbulence – matched to industry leading construction and design features, all resulting in exceptional performance, substantially reduced operating costs, and industry-leading reliability. 3. Hot treated clean air is cooled as it passes through the Heat Exchange Media and is exhausted from the stack into the atmosphere. Every ~ 3 minutes the process of air flow reverses direction as the poppet valves switch positions, allowing the heat captured in the ceramic media from the exiting clean air stream to heat the incoming process air. It is this regeneration of the ceramic heat exchanger media, with its high heat capacity which enables a Regenerative thermal oxidizer to deliver greater than 95% thermal efficiency. The CPI Regenerative Thermal Oxidizer (RTO) process begins with the touch of a button, which activates the system's hottest bed for damper positioning, opens the fresh air purge/idle damper, energizes the booster fan, purges the system with fresh air, ignites the burner, cycles the valves, and gradually brings the system up to the correct operating temperature. The Temperature Safety System (TSS) also monitors the temperature in the regenerators, combustion chamber in three places, and in the valve assembly's inlet and outlet. This helps safeguard the system from extreme temperature fluctuations that cause thermal stress and overall system fatigue. As soon as the required operating temperature is reached, the TSS enables the process lines to feed into the oxidizer, or holds the system in idle mode until production is ready. When production is ready the fresh air purge damper closes and one or more of the diverting dampers open to draw the volatile organic compounds (VOCs) off the process lines. A booster fan draws one or more VOC-laden exhausts from your process lines into the system. From there, VOCs are directed into one of the system's regenerators (an internally insulated vessel containing ceramic media). The contaminated gases are passed through the first regenerator, where energy is transferred from the ceramic media to the gas in order to elevate the temperature. This elevated temperature approaches the ignition level for most solvents and then is directed from the ceramic bed into the combustion chamber. As the stream exits the ceramic bed and travels through the internally lined combustion chamber, minimal heat is added .The oxidized gases are then directed to the second regenerator to absorb the heat energy. As the ceramic media loads with sufficient heat, the Posi-Seal Valves switch, and the gases are reversed through the system where the second regenerator bed continues the energy transfer and oxidation cycle before being released to the atmosphere, or to auxiliary heating systems such as; secondary air to air recovery, air to water recovery, air to oil recovery, or directly back to the process in a closed loop direct recirculation process. Your process is now in compliance with all clean air regulations! Catalytic Products International has been designing, manufacturing, and installing the world's most innovative thermal oxidizers since 1969. Throughout our long history, we continually strive to offer the most advanced air pollution control equipment. These constant efforts have led us to the development of the CPI Regenerative Thermal Oxidizer (RTO). Each system is custom engineered to exceed all worldwide air compliance guidelines at the lowest overall costs. 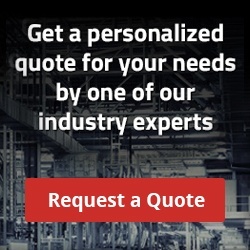 CPI RTOs are custom designed for the highest reliability with the lowest overall costs. The complete system is designed with a modular approach for the most cost-efficient solution. The typical CPI RTO is supplied as a 2-tower regenerator system fitted to our EvenFlo Valve Manifold. This modular approach satisfies your needs for a competitive installation cost and ensures that the Posi-Seal valves are properly installed and aligned prior to leaving the factory. Complementing the regenerator design is our unique cold face support system. While other systems merely rely on a perforated plate to support the ceramic media, CPI RTO systems use a superior supporting grid that allows the lowest pressure drops and highest structural integrity. Based on the application needs, the CPI RTO can be supplied with stainless steel metallurgy to resist chemical attack or added thermal stresses. Posi-Seal valves are designed to take advantage of a vertical axis that allows for soft seating action with self- centering guidance. The innovative feature of all Posi -Seal valves is the air tight machined seal that eliminates valve bypass and maintenance intensive gaskets. The Posi-Seal valve will be pneumatically operated and will cycle open or closed based on the program logic called for in your application. CPI RTO systems incorporate shaft and bearing cooling systems. This simple yet often overlooked feature provides a cool supply of air in the bearing tube and on the bearings. This prevents leakage of the higher pressure air on the inside of the oxidizer from escaping to atmosphere and helps cool the shaft and bearings for long life. The CPI RTO is internally insulated with ceramic insulating modules. This system provides low shell temperatures and helps to retain heat for improved efficiency. In some cases, the EvenFlo Manifold can be insulated to ensure that the pollutants that enter the oxidizer remain in a gaseous state. If the process constituents should condense at some point in the oxidizer, they can become a maintenance issue or worse yet, become a hazard to the equipment. Some pollutants will condense and collect on many of the surfaces of the oxidizers, leaving a sticky, tarry substance that is difficult to remove. Insulating our EvenFlo Manifold helps to prevent any condensation, and keeps your process air in a gaseous state. Each CPI Regenerative Thermal Oxidizer system is designed around the particular ceramic heat transfer matrix recommended for the application. CPI RTO systems can be designed using a layered structural ceramic media or a mix of structured and random media (saddles), depending on your application's requirements. The thermal heat transfer model is the key to a well designed and efficient system. With thermal rate efficiencies (TRE) ranging from 85 percent to 97 percent, you can be assured that even the lowest VOC concentrations can be economically destroyed. The CPI RTO also employs a bake-out feature that will allow periodic high temperature cleaning of condensate residue from the lower levels of the ceramic media beds and cold face support. Every CPI RTO system is integrated with our customized programmable logic controller PLC-control panel called Temperature Safety System (TSS) Control. TSS communicates with the CPI RTO system and your process for optimal performance, safety and reliability. We use our proprietary thermal control logic and multiple temperature inputs to maximize the regenerator's thermal efficiency. This unique control technique constantly adjusts valve timing to maximize thermal efficiency without compromise in destruction efficiency. No other supplier goes to these extremes to maximize the performance of their RTO. Metallurgical conformity and assessment process to ensure corrosion, and thermally resistant materials are used throughout the system. A drop in place installation has proven to be highly desirable. For the size ranges up to 15,000 scfm this includes media loading, pre-wiring and extensive I/O quality control that ensures the control system is ready to operate. Provides a method of controlling the RTO under high VOC conditions and ensures VOC destruction is maintained without cause for high-temperature shut-down. System for corrosive air streams, including halogenated compounds such as chlorine, fluorine, and bromine. 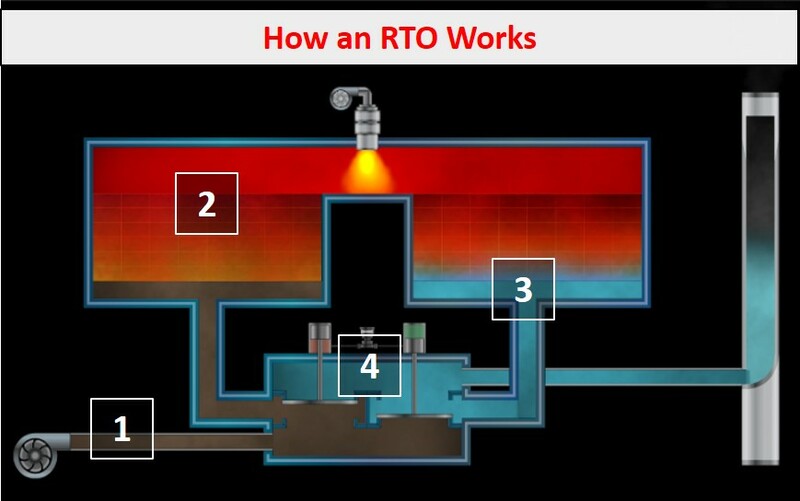 To enable +99% destruction efficiency with two-chamber RTO.